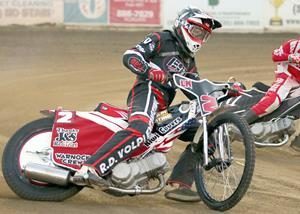 It been going on for 27 years, it’s one of the longest running grudge matches in modern speedway motorcycle racing history. 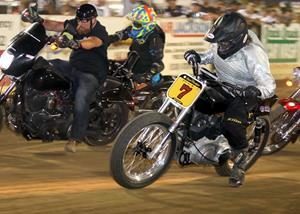 Friday night the rivalry was renewed as Fast Friday’s Motorcycle Speedway presented the 27th annual North vs. South Challenge in Auburn. 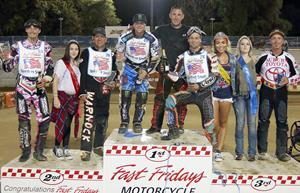 Six of the best speedway riders from Southern California journeyed north to meet six of the best speedway riders from Northern California to see who would go down in the books as winners this year. The South was looking to avenge last year’s loss and get back in the winners column but the North team with skillful riding and some careful tactical moves kept their winning streak going with a 72-67 win. 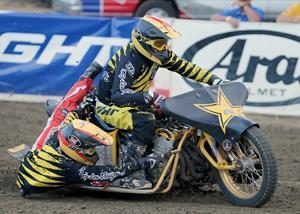 Every talented speedway rider in California has participated at one time or another in the annual North vs. South match-up. 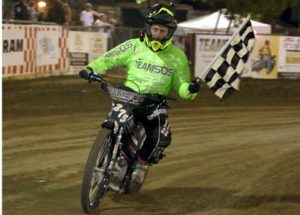 This year’s North team was anchored by national champion Billy Janniro and included experienced riders Bart Bast, Ryan Bast, Russell Green, Tommy Hedden and Daniel Faria. Bart Bast’s history with the challenge goes way back and includes the distinction of riding in all but one of the 27 meetings and scoring more points than any other rider over the history of the race. The South team included Charlie Venegas, Dillon Ruml, Aaron Fox, Tim Gomez, Bryan Yarrow and Sammy Ramirez. Talented, experienced rides all around on both teams. The score going into the meeting was set at 17 wins for the North and 9 for the South. The South team would have to look back to 2015 for the last time they won the event. 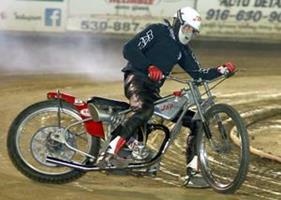 The North/South racing format is team racing, one of the few team racing events held each year at Fast Fridays. 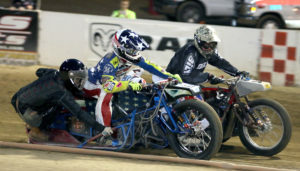 Each team has six riders paired together in 18 heat races scoring three points for a win, two points for a second place finish, one point for third and zero points for a fourth place finish. The score can swing wildly throughout the night with the use of a Joker and tactical substitutions when one team is down by at least six points. After the 18 heat races team captains place two pairs of riders in a Bonus Round with a B main and A main where all points increase. The North team jumped ahead on the first race with a powerful finish from the team of Janniro and Faria scoring five points, but after the first round of three heats the South evened the score at nine. After six heats, two first-second finishes by North team put them in the lead by a convincing 22-14 score. Venegas was excluded in heat four and heat seven for rolling into the tapes by referee Steve Lucero setting the South back and after nine heats the score was 31-23 with the North still ahead. In heat ten, down seven points the South used their Joker with Venegas who won the race doubling their points putting them within one point of the North and the closest they had been since the tie after heat three at 32-31. After a strong performance in heat 12 by the South team of Fox/Yarrow the South pulled ahead for the first time of the evening leading 38-37. After 18 heats of great, exciting team racing from both teams the North ended up holding the lead 59-52 going into the bonus rounds. But with a score that close it could go either way, the last two races deciding the winner as the scoring increased. 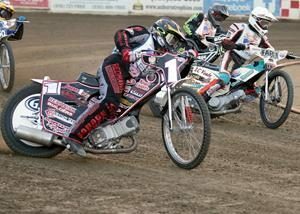 It was a fine night of good hearted, friendly but tough racing by all riders. All of the rider pairs rode well together working as a team instead of individuals. The total score in the longstanding challenge is now sits at 18-9 with the South looking forward to next year. 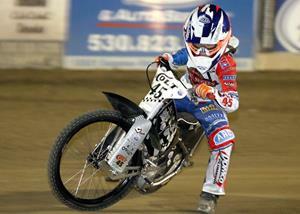 In the youth program Landon Norton won the Youth 250cc main event, Timmy Dion won the Youth 250cc Consolation race. 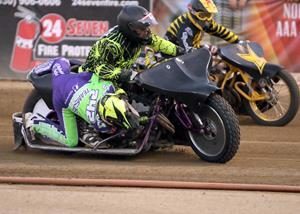 Colton Nelson, a tough, never give up youth rider who gives it his all every week won the Youth 150cc main event, his first of season. National Championship Billy Janniro led the North team in scoring with 20 points. Colton Nelson won the Youth 150cc main event. The South’s Dillon Ruml was the high scorer of the evening leading all riders with 21 points. 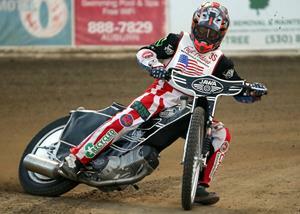 Landon Norton won the Youth 250cc main event. The North team celebrating their win with the Fast Friday’s trophy girls (left-right) Russell Green, Tommy Hedden, Ryan Bast, Billy Janniro, Daniel Faria and Bart Bast. The event highlighted team racing with tight action in turn one in every race. 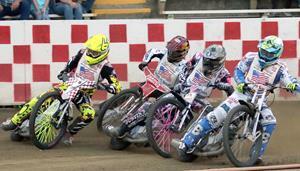 Pictured here in heat three are (left-right) Bryan Yarrow, Bart Bast, Russell Green and Aaron Fox. Both the North and South teams gathered for a grand entry before the racing began. (left-south) The South-Sammy Ramirez, Bryan Yarrow, Dillon Ruml, Aaron Fox, Tim Gomez, Charlie Venegas, Fast Friday owner David Joiner, the North team, Billy Janniro, Daniel Faria, Tommy Hedden, Ryan Bast, Russell Green and Bart Bast.